In order to make the attack, the canoes had to locate their targets and approach stealthily right up to the hulls of the vessels, apply the charges with their time fuses, etc, and make off again into the comparative safety of the night to their other targets. On 2 September 1943, a captured Japanese motor sampan set out from Exmouth in Western Australia bound for Singapore, well inside Japanese controlled waters. By the time they returned nearly seven weeks later, the crew of 14 had carried out one of the most successful clandestine raids in Australian history. The 68 ton Kofuku Maru had been seized by British authorities in Singapore following Japan’s entry into the war. In 1943 she was renamed Krait and assigned to the Services Reconnaissance Department, the parent organisation of the famed Z Special Unit, which was responsible for covert operations in enemy territory. The objective of Operation JAYWICK was for a group of Australian and British Z Special Unit members to attack Japanese shipping in Singapore using time delayed limpet mines. The operatives and crew included 10 sailors and four soldiers. The expedition was led by Major Ivan Lyon of the Gordon Highlanders who, along with Major Jock Campbell of the King’s Own Scottish Borderers, had devised the plan in 1942 after they had escaped the Japanese invasion of Singapore. Essential to the plan was a vessel that could pose as a local fishing boat or trader. 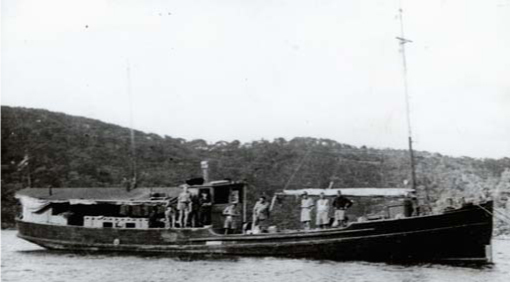 Krait was identified as suitable for the task, however, persistent engine problems with the sampan meant that the operation was abandoned early in 1943. The plan was resurrected later in the year when Krait had been made seaworthy. In Exmouth in August 1943, Krait was loaded with her supplies and equipment, including three two-man canoes in which the Z Special Unit members would enter the selected harbours and attack the Japanese ships. She departed Exmouth on the evening of 1 September and promptly broke a propeller extension shaft. USS Chanticleer assisted with the repairs and Krait departed again the following afternoon, her route taking her through Lombok Strait, across the Java Sea, along the south west and west coasts of Borneo and then west to the Lingga Archipelago and the islands south of Singapore. The crew hoisted the Japanese ensign on 6 September and Krait approached Lombok Strait, the first ‘danger area’ of her voyage, just after noon on 8 September. The Eastern Archipelago Pilot promised ‘very hazy’ conditions in the area at that time of year, but Krait approached the southern entrance to the strait in conditions of perfect visibility. The decision was made, however, to ignore the threat of enemy aerial reconnaissance and a course was set for Lombok Strait. Apart from the dangers posed by Japanese patrols, the strong currents in Lombok Strait posed significant navigational problems for Krait. Progress was excruciatingly slow, at one stage the current forcing the sampan backwards for an hour. It was nearly 24 hours later before Krait left Lombok Strait behind and entered the Java Sea at around 10:00 on 9 September. The crew of Krait and operatives of Operation JAYWICK. 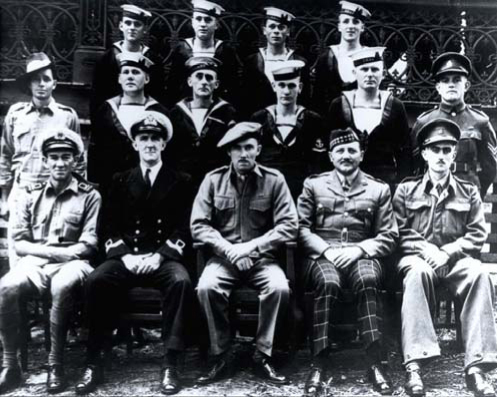 Left to right (Front): LEUT Ted Carse, LEUT Donald Davidson, MAJ Ivan Lyon, MAJ Jock Campbell (did not accompany the expedition), LT Robert Page; (Middle): CPL Andrew Crilly, LS Kevin Cain, LS James McDowell, L.TEL Horrie Young, AB Walter Falls, CPL Ron Morris; (Back): ABs Moss Berryman, Frederic Marsh, Arthur Jones and Andrew Huston. The ‘promised’ haze descended that morning and assisted in Krait’s uncontested passage across the Java Sea. The crew applied a dark dye to their bodies enhancing their appearance as local fishermen helping Krait safely make her way to the Lingga Archipelago. She anchored off Pulau Pompong on the evening of 16 September. Pompong had been identified as a possible disembarkation point for the operatives but as dawn broke it was decided that the island was unsuitable. The next day was spent zigzagging through the islands in the area searching for an alternative hideout. That evening a great deal of enemy activity in the form of searchlights, floatplanes and transport aircraft made it evident that this ‘was not a healthy area for Krait’. Eventually, at 02:00 on 18 September, she anchored off Pulau Panjang and began disembarking the operatives. Three hours later, Krait was making her way back to Borneo with orders to rendezvous with the operatives on the night of 1-2 October at Pompong. Krait spent the next eleven days busily avoiding enemy contact off the south coast of Borneo, contending with heavy seas and listening to the radio every night for any news about the operation. The six operatives spent the first two days after landing on Panjang observing Japanese movements in the approaches to Singapore and preparing for the attack. At dusk on 20 September, they boarded their canoes, loaded with enough food and water for a week, and proceeded to the extreme north of the Rhio Archipelago. For the next three nights the canoes ‘island hopped’ their way through the archipelago and, at midnight on the evening of 22 September, reached Pulau Dongas some eight miles south south east of Singapore Harbour. On the afternoon of 24 September, a concentration of ships totalling around 65,000 tons had gathered in the Roads nearby Dongas. The tides in the Roads made an attack in the canoes extremely difficult, but the size of the target proved too tempting to resist. The party set out at 10:00 but as they approached their respective targets, the tidal currents proved to be too strong and the attack was abandoned. In light of this unsuccessful attempt, the party shifted from Dongas to a better placed observation post on Pulau Subar, overlooking the Examination Anchorage. Half way through the work, Huston drew my attention to a man who was watching us intently from a porthole ten feet above. He continued to gaze until just before we left the ship, when he withdrew his head and lighted his bedside lamp. He took no apparent action and we set off for Dongas 12 miles away. The adverse currents prevented Lyon and Huston from making any other attacks. Canoe 3 made for its first target area at Pulau Bukum and found the currents to be favourable and was able to attach mines to a freighter at the Bukum wharves before drifting with the current towards Keppel Harbour. They attached mines to two more freighters before beginning the journey back to Dongas. Canoe 2, meanwhile, proceeded independently to its target areas to the east of Keppel Harbour and the Roads. Davidson and Falls arrived at the harbour and, with no boom vessel in attendance, set about finding a way through the boom and into the harbour itself. While doing so they were nearly run down by a tug which had apparently failed to see them. The tug ‘passed approximately 20 paces from us and we could see a few people moving about the deck’. Having passed through the open boom gate, Davidson and Falls found only small ships within the harbour. They turned back through the boom and into the Roads where they attacked three cargo vessels of around 5000 tons each. With their limpet mines set, Davidson and Falls set out independently for the rendezvous with Krait on Pulau Pompong. Between 05:15 and 05:50, seven explosions were heard indicating that all the attacks had been successful. Seven Japanese ships had been sunk or severely damaged amounting to between 37,000 and 39,000 tons. Krait, meanwhile, made her way back to the rendezvous point on Pompong, arriving just after midnight on the morning of 2 October. Shortly afterwards, the crew recovered Davidson and Falls in Canoe 2. The other two canoes were in the area but could not locate the sampan in the dark. Krait retired to the south of the Temiang Strait and returned to pick up the other canoes at around 21:00 on 3 October. Krait made a quiet journey across the Java Sea and approached the Lombok Strait on the afternoon of 11 October. With the crew once again in disguise, she entered the strait later that evening. Shortly before midnight a Japanese destroyer was sighted approaching rapidly on Krait’s port beam. She approached to within 100 yards; however, Krait’s disguise was apparently sufficient to allay any suspicions and the ship turned away without even shining a searchlight on the sampan. Krait cleared the strait early the next morning and entered comparatively safe waters. She arrived at Exmouth on 19 October 1943 having covered some 4000 miles during her 48 day absence. There were no casualties and all involved in the operation were either decorated or mentioned in despatches. Krait was not commissioned at the time of the operation but was later commissioned in 1944 and was based at Darwin for the remainder of hostilities. She is still afloat today and is maintained by the Australian National Maritime Museum in Sydney. ↑ Colonel PJF Chapman-Walker, Director, Services Reconnaissance Department, 'Operation JAYWICK report', 21 July 1944, copy held by SPC-A (file number 52Y). ↑ G Hermon Gill, 'Royal Australian Navy 1942-1945', Australian War Memorial, Canberra, 1957, pp. 318-319. ↑ Extract from diary of Major I Lyon, Operation JAYWICK narrative account, copy held by SPC-A (file number 52Y). ↑ Chapman-Walker, 'Operation JAYWICK report'. ↑ Lyon, 'Operation JAYWICK narrative account'. ↑ AB WG Falls, 'Operation JAYWICK report', 21 July 1944, Jaywick Operation Personal Statements. ↑ Gill, 'Royal Australian Navy 1942-1945', p. 324.